Long-acting reversible contraceptives (LARCs), which include intrauterine devices (IUDs) and subdermal hormonal implants, are gaining popularity due to their high efficacy in preventing unintended pregnancies. 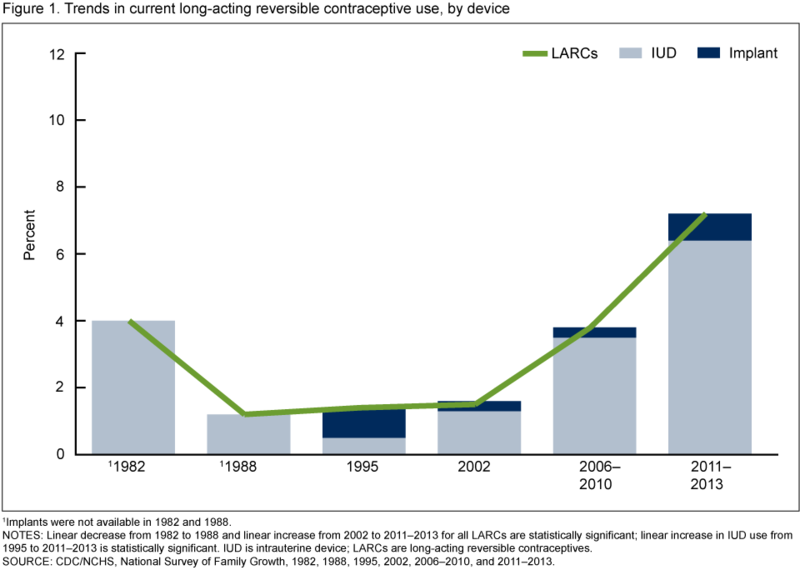 IUD use was more common among U.S. women in the 1970s before concerns over safety led to a decline in use; however, since approval of a 5-year contraceptive implant in 1990 and redesigned IUDs, there has been growing interest in the use of LARCs for unintended pregnancy prevention. Using data from the 1982, 1988, 1995, 2002, 2006–2010, and 2011–2013 National Survey of Family Growth, a new NCHS report examines trends in current LARC use among women aged 15–44 and describes patterns of use by age, race and Hispanic origin, and parity. Use of LARCs declined between 1982 and 1988, remained stable through 2002, and then increased nearly five-fold in the last decade among women aged 15–44, from 1.5% in 2002 to 7.2% in 2011–2013. The percentage of women using LARCs has remained highest among women aged 25–34, with more than twice as many women aged 25–34 (11.1%) using LARCs in 2011–2013 compared with women aged 15–24 (5.0%) and aged 35–44 (5.3%). After decreasing between 1982 and 1988 and remaining stable from 1988 through 1995, LARC-use patterns diverged among Hispanic, non-Hispanic white, and non-Hispanic black women. Women who have had at least one birth use LARCs at a higher rate compared with women who have had no previous births, and this difference has increased over time. This entry was posted on Tuesday, February 24th, 2015 at 3:08 pm and is filed under contraception, National Survey of Family Growth. You can follow any responses to this entry through the RSS 2.0 feed. You can leave a response, or trackback from your own site.